For the mask used to inhale gas through, see Mask § Functional masks. The gas mask is a mask used to protect the user from inhaling airborne pollutants and toxic gases. The mask forms a sealed cover over the nose and mouth, but may also cover the eyes and other vulnerable soft tissues of the face. Some gas masks are also respirators, though the word gas mask is often used to refer to military equipment (e.g. field protective mask). The user of the gas mask is not protected from gas that the skin can absorb. Most gas mask filters will last around 24 hours in a nuclear biological chemical (NBC) situation. Absorption is the process of being drawn into a (usually larger) body, or substrate, and adsorption is the process of deposition upon a surface. This can be used to remove both particulate and gaseous hazards. Although some form of reaction may take place, it is not necessary; the method may work by attractive charges. For example, if the target particles are positively charged, a negatively charged substrate may be used. Examples of substrates include activated carbon, and zeolites. This effect can be very simple and highly effective, for example using a damp cloth to cover the mouth and nose while escaping a fire. While this method can be effective at trapping particulates produced by combustion, it does not filter out harmful gases which may be toxic or which displace the oxygen required for survival. MCU-2/P protective mask on a U.S. Navy member. The filter cartridge is on the left side of the mouth, which makes it easier to aim a rifle right-handed. US Navy EOD M45 gas mask system. Gas mask used by the French military. The filter cartridge is connected via a flexible hose. Gas masks have a limited useful lifespan that is related to the absorbent capacity of the filter. Once the filter has been saturated with hazardous chemicals, it ceases to provide protection and the user may be injured. Most gas masks use sealing caps over the air intake to prevent the filter from degrading before use, but the protective abilities also degrade as the filter ages or if it is exposed to moisture and heat. Very old unused gas mask filters from World War II may not be effective at all in protecting the user, and can even potentially cause harm to the user due to long-term changes in the filter chemical composition. An asbestos containing Russian GP-5 filter and a safe modern one in comparison. 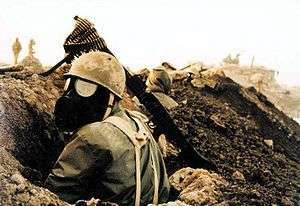 World War II gas masks contained blue asbestos in their filters. It is unknown how long for certain the material was used in filters. Breathing blue asbestos in the factories resulted in the death of 10% of the workforce due to pleural and peritoneal mesothelioma. This rate was between 2.5 and 3.2 times the normal incidence of lung or respiratory cancers. 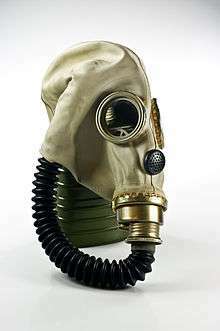 Many scare stories have originated from various Russian gas masks and their filters that are now common in surplus stores; the GP-5 was often considered to have an asbestos filter. In October 2013, an asbestos lab in Salt Lake City found out that the particle filter is made of 7.5% asbestos. The filter is made so that the asbestos fibres cannot be breathed in, if the filter layer is not damaged.. Nearly all Russian Cold War period masks contain asbestos. Modern gas masks are quite safe and do not use asbestos, but it is still important to be careful when using a modern gas mask. Typically, masks using 40 mm connections are a more recent design. Rubber degrades with time, so new in-box "modern type" masks can be cracked and leak. Also, the U.S C2 canister (black) was shown to contain hexavalent chromium: the studies by the U.S. Army Chemical Corps showed that the levels in the filter were acceptable, but imply caution when using, as it is a carcinogen. Particle filters are often included, because in many cases, the hazardous materials are in the form of mist, which is captured already by the particle filter before entering the chemical adsorber. Filtration may be aided with an air pump to improve wearer comfort. Filtration of air is only possible if there is sufficient oxygen in the first place. Thus, when handling asphyxiants, or when ventilation is poor or the hazards are unknown, filtration is not possible and air must be supplied from a pressurized bottle as in scuba diving. Also, a gas mask does not protect against other hazards; for example, corrosive gases can damage the skin, requiring full-body protection. A 1939 Second World War-era baby's gas mask in Monmouth Regimental Museum. This design covered the whole of the baby except for its legs. A modern mask typically is constructed of an elastic polymer in various sizes. It is fitted with various adjustable straps which may be tightened to secure a good fit. Crucially, it is connected to a filter cartridge near the mouth either directly, or via a flexible hose. Some models contain drinking tubes which may be connected to a water bottle. Corrective lens inserts are also available for users who require them. Masks are typically tested for fit before use. After a mask is fitted, it is often tested by various challenge agents. Isoamyl acetate, a synthetic banana flavourant, and camphor are often used as innocuous challenge agents. In the military, teargases such as CN, CS, and stannic chloride in a chamber may be used to give the users confidence in the efficacy of the mask. This principle relies on substances harmful to humans being usually more reactive than air. This method of separation will use some form of generally reactive substance (for example an acid) coating or supported by some solid material. An example is synthetic resins. These can be created with different groups of atoms (usually called functional groups) that have different properties. Thus a resin can be tailored to a particular toxic group. When the reactive substance comes in contact with the resin, it will bond to it, removing it from the air stream. It may also exchange with a less harmful substance at this site. The user may be exposed to many types of toxic material. Military personnel are especially prone to being exposed to a diverse range of toxic gases. However, if the mask is for a particular use (such as the protection from a specific toxic material in a factory), then the design can be much simpler and the cost lower. The protection will wear off over time. Filters will clog up, substrates for absorption will fill up, and reactive filters will run out of reactive substance. Thus the user only has protection for a limited time, and then he must either replace the filter device in the mask, or use a new mask. According to Popular Mechanics, "The common sponge was used in ancient Greece as a gas mask..." An early type of rudimentary gas mask was invented in the 9th century by the Banu Musa brothers in Baghdad, Iraq. They described it in their Book of Ingenious Devices, mainly for protecting workers in polluted wells. Primitive respirator examples were used by miners and introduced by Alexander von Humboldt already in 1799, when he worked as a mining engineer in Prussia. 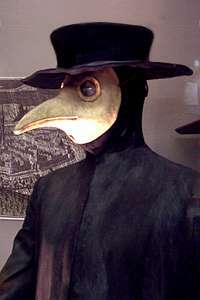 There were also plague doctor's bird-beak-shaped mask filled with herbs originating from the seventeenth century. The forerunner to the modern gas mask was invented in 1847 by Lewis P. Haslett, a device that contained elements that allowed breathing through a nose and mouthpiece, inhalation of air through a bulb-shaped filter, and a vent to exhale air back into the atmosphere. According to First Facts, it states that the "gas mask resembling the modern type was patented by Lewis Phectic Haslett of Louisville, Kentucky who received a patent on June 12, 1849." U.S. patent #6,529 issued to Haslett, described the first "Inhaler or Lung Protector" that filtered dust from the air. Early versions were constructed by the Scottish chemist John Stenhouse in 1854 and the physicist John Tyndall in the 1870s. Another early design was the "Safety Hood and Smoke Protector" invented by Garrett Morgan in 1912, and patented in 1914. It was a simple device consisting of a cotton hood with two hoses which hung down to the floor, allowing the wearer to breathe the safer air found there. In addition, moist sponges were inserted at the end of the hoses in order to better filter the air. This was later modified to include its own air supply, leading to World War I era gas masks. 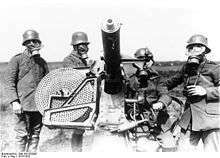 The first use of poison gas on the Western Front was on 22 April 1915, by the Germans at Ypres, against Canadian and French colonial troops. The initial response was to equip troops with cotton mouth pads for protection. Soon afterwards the British added a long cloth which was used to tie chemical-soaked mouth pads into place, and which was called the Black Veil Respirator. Dr. Cluny MacPherson of Newfoundland Regiment brought the idea of a mask made of chemical absorbing fabric and which fitted over the entire head to England, and this was developed into the British Hypo helmet of June 1915. This primitive type of mask went through several stages of development before being superseded in 1916 by the canister gas mask. This had a mask connected to a tin can containing the absorbent materials by a hose. The British Royal Society of Chemistry claims that British scientist Edward Harrison developed the first practical gas mask for mass production (towards the end of 1916), a claim supported by a thank-you note written by Winston Churchill. James B. Garner in 1915, around the time he invented his gas mask. American chemist and inventor James Bert Garner is credited by American sources with the invention of the gas mask in April 1915. Reading a newspaper article describing a gas attack on British forces which he thought had employed chlorine gas, Garner remembered experiments he had performed while teaching at the University of Chicago, thus he set about creating the first gas mask, which he tested on two of his associates in a gas filled chamber. Following the success of the test, he provided the results to the British government. Also in World War I, since dogs were frequently used on the front lines, a special type of gas mask was developed that dogs were trained to wear. Other gas masks were developed during World War I and the time following for horses in the various mounted units that operated near the front lines. In America thousands of gas masks were produced for American as well as Allied troops. Mine Safety Appliances was a chief producer. This mask was later used widely in industry. The modern gas mask that people in the USA are familiar with, was developed in 1944 by the US Army Chemical Warfare Service. It was made of plastic and rubber-like material that greatly reduced the weight and bulk, compared to World War I gas masks and fitted the user's face more snugly and comfortably. The main improvement was replacing the separate filter canister connected with a hose by a filter canister screwed on the side of the gas mask, that could be replaced easily. Also, it had replaceable plastic lenses, much helping vision. Gas mask development since has mirrored the development of chemical agents in warfare, filling the need to protect against ever more deadly threats, biological weapons, and radioactive dust in the nuclear era. However, where agents that cause harm through contact or penetration of the skin occurs, such as blister agent or nerve agent, a gas mask alone is not sufficient protection, and full protective clothing must be worn in addition, to protect from contact with the atmosphere. For reasons of civil defense and personal protection, individuals often buy gas masks believing that they protect against the harmful effects of an attack with nuclear, biological, or chemical (NBC) agents; which is only partially true, as gas masks protect only against respiratory absorption. Whilst most military gas masks are designed to be capable of protection against all NBC agents, they can have filter canisters proof against those agents (heavier) or only against riot control agents and smoke (lighter, and often used for training purposes); likewise there are lightweight masks solely for use in riot control agents and not for NBC situations. Although thorough training and the availability of gas masks and other protective equipment can nullify the casualty-causing effects of an attack by chemical agents, troops who are forced to operate in full protective gear are less efficient in completing tasks, tire easily, and may be affected psychologically by the threat of attack by these weapons. During the Cold War era, it was seen as inevitable that there would be a constant NBC threat on the battlefield, and thus troops needed protection in which they could remain fully functional; thus protective gear, and especially gas masks have evolved to incorporate innovations in terms of increasing user-comfort, and in compatibility with other equipment (from drinking devices to artificial respiration tubes, to communications systems etc.). The gas mask has thus now arrived at a 'fourth generation' of development. During the Iran–Iraq War (1980–88), Iraq developed its chemical weapons program with the help of Europeans countries (such as Germany and France), and used them large-scale against Iranians as well as against Iraqi Kurd. Iran was unprepared for chemical warfare. In 1984, Iran received gas masks from the Republic of Korea and East Germany, but the Korean masks were not suited for the faces of non-East Asian people and the filter only lasted for 15 minutes, and the 5,000 masks bought from East Germany proved to be not gas masks but spray painting goggles. As late as 1986, Iranian diplomats still traveled in Europe to buy active charcoal and models of filters in order to produce defensive gear domestically. In April 1988, Iran started domestic production of gas masks by the Iran Yasa factories. Most civilians learned how to use gas masks through the civil defense department, but children received most gas mask education in school drills. 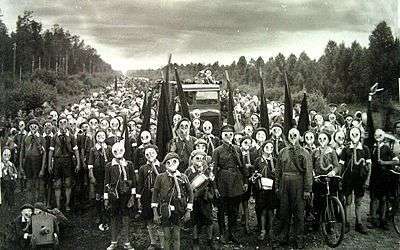 Schools would implement gas mask education and training after the outbreak of a war. Schools would harshly enforce the compulsory carrying of gas masks at all times. Gas mask and air raid drills were closely related and children would be made to wear gas masks in everyday activities, including gymnastics. The wearing of gas masks in the classrooms were especially difficult for teachers as they had trouble distinguishing one child from another. The gas masks became as uniform as the students' uniforms. Other civilians learned the use of a gas mask through posters, pamphlets, and radio lectures, but children learned through cartoons and rhymes such as "coughs and sneezes spread diseases". Activated charcoal is a common component of gas masks. It is a form of carbon with an extremely high surface area which attracts all manner of pollutants from air and water. Pollutants do not react with the carbon but are adsorbed into the pores. Over time the activated carbon becomes thoroughly coated and it ceases to remove pollutants. However, the charcoal can be reactivated and restored to its original state by baking the charcoal with high heat, which evaporates or burns off the pollutants. The first effective filtering activated charcoal gas mask in the world was invented in 1915 by Russian chemist Nikolay Zelinsky. In the first gas masks of World War I, it was initially found that wood charcoal was a good absorbent of poison gases. In about 1918, it was found that charcoals made from the shells and seeds of various fruits and nuts such as coconuts, chestnuts, horse-chestnuts, and peach stones performed much better than wood charcoal. These waste materials were collected from the public in recycling programs to assist the war effort. ↑ Acheson, E D; Gardner, M J; Pippard, E C; Grime, L P (1982). "Mortality of two groups of women who manufactured gas masks from chrysotile and crocidolite asbestos: a 40-year follow-up". Occupational and Environmental Medicine. 39 (4): 344–8. doi:10.1136/oem.39.4.344. PMC 1009064 . PMID 6291580. ↑ "Guide for selection and use of filtering devices" (PDF). draeger.com. ↑ Young, M. J. L. (1990). The Cambridge history of Arabic literature. Cambridge University Press. p. 264. ISBN 0-521-32763-6. ↑ "The invention of the gas mask". Ian Taggart. ↑ Drobnicki, John A.; Asaro, Richard (2001). "Historical Fabrications on the Internet". In Su, Di. Evolution in Reference and Information Services: The Impact of the Internet. Binghamton, New York: Haworth Information Press. p. 144. ISBN 978-0-7890-1723-9. ↑ "Lewis P". United States Patent and Trademark office. ↑ Jr, Henry Louis Gates; Higginbotham, Evelyn Brooks (2004-04-29). African American Lives. Oxford University Press. ISBN 9780199882861. By World War I, Morgan had modified the mask to carry its own air supply, creating the first gas mask, which by 1917 was standard equipment for the U.S. Army. ↑ "Garrett Augustus Morgan". PBS Who Made America?. He sold the hoods to the U.S. Navy, and the Army used them in World War I. ↑ "Morgan, Garrett 1877-1963". Encyclopedia.com Contemporary Black Biography. Morgan would later perfect his “breathing device” into a gas mask that was used extensively in World War I. ↑ "Garrett Morgan Biography". Biography.com People. Morgan's breathing device became the prototype and precursor for the gas masks used during World War I, protecting soldiers from toxic gas used in warfare. ↑ Victor Lefebure (1923). The Riddle of the Rhine: Chemical Strategy in Peace and War. The Chemical Foundation Inc. ISBN 0-585-23269-5. ↑ "The UK". The Gas Mask Database. ↑ "Small Box Respirator". Manchester Regiment. Retrieved 2013-05-27. ↑ "Gas mask inventor Harrison honoured in death by Churchill". Royal Society of Chemistry. Retrieved 2008-06-12. ↑ "Boone County Native Invented the Gas Mask" (PDF). 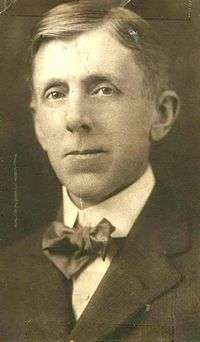 Ralph W. Stark. ↑ "Gas Mask Weighing Half As Much." Popular Sciences, March 1944, p. 74. ↑ Zanders, Jean Pascal (March 7, 2001). "Iranian Use of Chemical Weapons: A Critical Analysis of Past Allegations". CNS Briefings. James Martin Center for Nonproliferation Studies. Archived from the original on March 20, 2015. Retrieved 27 March 2016. ↑ Kozhevnikov, A.B. (2004). Stalin's great science: the times and adventures of Soviet physicists (illustrated, reprint ed.). Imperial College Press. pp. 10–11. ISBN 978-1-86094-419-2. Retrieved 2009-04-28. Wikimedia Commons has media related to Gas mask. Gas Masks UK Information on gas masks from many countries.